when using tubing thru your transom for your hydraulic Place Diverter. Bracket for Place Diverter Hydraulic Power Unit. connect to your Place Diverter manual control. Teflon O-ring used to seal the turning Knuckle. Rod End Bearing 4300 Series Cable S.S. Replacement Diode kit for your Hydraulic Place Diverter. 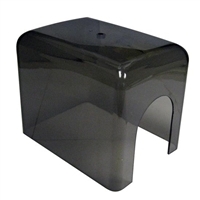 Lexan Cover for the Hydraulic Power Unit used in the Place Diverter. Place Diverter Cylinder Rod End Bearing S.S. These rod end bearings are designed to screw onto your Place Diverter Hydraulic Cylinder. Place Diverter replacement hydraulic cylinder. Replacement switch for the Hydraulic Place Diverter. The small rudder is designed to improve low speed maneuverability. The large rudder is designed to improve low speed maneuverability. Manual control for your Place Diverter. Mounts to the floor. Hydraulic Pump Only "Place Diverter"
Factory replacement Hydraulic pump for the Place Diverter.